So you might not be able to tell what this is a photograph of. I'm sure you've seen them though -- egglings? Little eggs of soil all ready for you to tap open with a spoon and drop little packets of seeds into? This little guy was a parting gift at an winter preview for Nest Event Loft a week or so ago. I got basil! And seeing as I just signed up for a floral arrangement class at The Bronx Botanical Garden I figure its high time I learn to not kill green things. So far so good, right? See the green coming through? So excited for my little food flavoring friend! 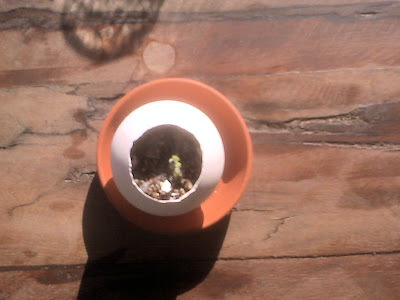 I am using little Basil's growth as a symbol for my new journeys. As I turn to florals, more crafts, and more baking, all of which will be shared with you...my little friend will be growing too. We'll be growing insieme (that's Italian for together :) ). Ciao bellas!